3v3, 4v4 or 5v5 in the area that is marked out. Players on the byline (either side of the goal) combine with their team by playing a first time pass either to another attacking player (third player running) to finish first time (more points for doing this) or to player that played them the ball (for less points). If the attacking player can't shoot they restart and must go via the by line player before they can shoot again. Teams need to react quickly during transition. This game requires the outfield players to work at a high intensity for the period they are involved. - All players must have a touch before they can play to the byline. - Limit number of touches. 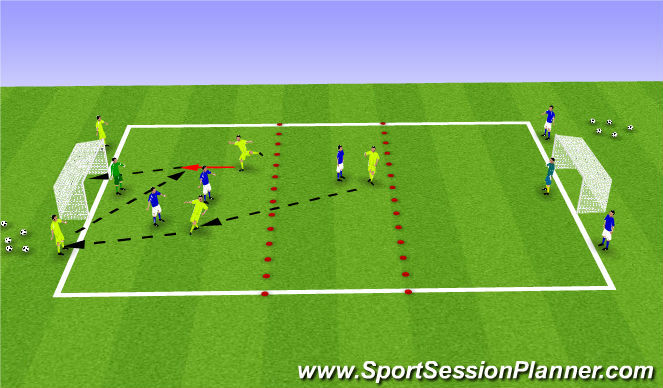 - Restrict player on bye line to one touch or two touch. - Complete the perfect hat-trick as a team, one right foot, one left foot, one header or volley. - Score with first touch for bonus points. - Striker reaction -- take it first time or have a touch. Take the keeper by surprise, don't let him set himself.